Empire Auto Spa offers detailing services for Orlando and the surrounding areas. The company specializes in luxury automobiles, boats, RVs and motorcycles. 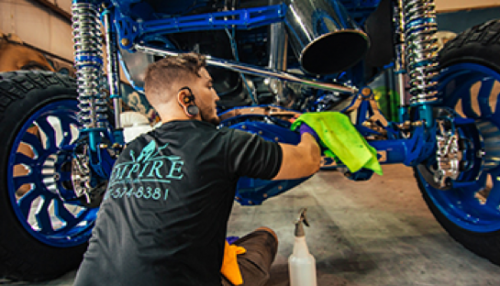 Sanford FL, USA - March 26, 2019 / / — Empire Auto Spa and Shawn Beecher are pleased to announce that they have updated information available on the auto detailing Orlando website. The firm offers a wide range of services related to auto detailing and paint protection film. These include individualized vehicle inspection with one of the professional technicians; education on different types of vehicle damages; demonstrating a spot test on the customer's vehicle to show the difference and informing the client on what it will take to keep their vehicle looking its best. All the detailing services include a luxury hand car wash; clay bar application; complete exterior polish; exterior decontamination wipe; coating applied to all exterior surfaces including painted surfaces, plastic surfaces, and windshield; full interior detail; conditioning of all leather surfaces; and Fabric Guard protection of remaining interior surfaces.